The game’s decisive moment arrived as early as the 12th minute, and although Michael Morton’s side threw everything at their opponents in the second half, they lacked the cutting edge to avoid a third successive defeat. 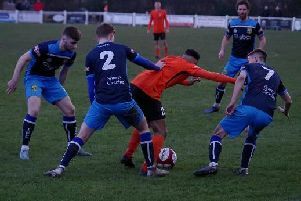 Despite a positive start by the Brewers, with Casey Stewart looking particularly lively, Hyde broke the deadlock shortly after the 10-minute mark. Aaron Hardy’s pass was intercepted by Elliot Rokka and he sent Adam Gilchrist clean through on goal. The Tigers number nine weighed up his options before rounding glovmeman Michael Ingham and just turning home despite Jason Mycoe almost recovering to clear the danger. Albion picked themselves straight back up and came close to levelling two minutes later when the irrepressible Pete Davidson latched onto a loose ball and poked just wide. Having got his shot away, Davidson was clattered into by Hyde full-back Kyle Brownhill, but referee Mr. Johnstone was unmoved. In an opening half of few chances, it was another stray pass from the hosts that almost gifted Darren Kelly’s team a second goal. A miscued ball from Mycoe allowed debutant Rokka to drive in on goal, but the Tranmere Rovers loanee arrowed wide of the mark. Hyde danger-man Max Leonard came close to extending the away lead six minutes into the second period, but his powerfully -haped free-kick from distance whistled just past the post. The travelling fans were up in arms moments later as they protested for a penalty kick after Mycoe cleared the ball away from Luke Porritt, but again the man in the middle turned his back. The Tigers had started the second 45 strongly and they thought that had a second when Leonard headed Janni Lipka’s free-kick into the net, but the flag was up immediately for offside. Taddy responded well and started to put the league leaders under a sustained amount of pressure. The likes of Chris Howarth, Aiden Savory, Billy Whitehouse and Stewart continued to get into dangerous areas but the trigger remained un-pulled. A huge roar of anticipation came from the Taddy faithful when Stewart drove forward into space, but the tricky attacker couldn’t sneak past the towering figure of Tyrone Gay. The visitors continued to defend well as Albion threw absolutely everything forwards. Harry Sheppeard’s pace was causing serious problems as ever, and the 18-year-old full-back drove all the way to the by-line before his pull back was cut out. And then minutes later, the electric defender marauded down the left-wing and was hauled down just outside the penalty box, earning his team one last chance to force an equaliser. Unfortunately for Tadcaster, Conor Sellars’ free-kick was too strong and evaded everyone in the penalty area, which in the end summed up Albion’s afternoon. Defeat for Morton’s men, who have scored just once in their last four outings, further dents their hopes of earning a play-off spot, dropping them down to ninth the league table.